Working on cloth and paper grounds we will explore layering multiple images using Thermofax screens and gelatine plates. Thermofax screens are small mesh screens burnt out with a variety of images and textures and can be used with a range of media including fabric printing ink, discharge paste and dye based printing ink. Gelatin printing is similar to mono-printing; where water-based printing ink is applied to the gelatine plate (bought or homemade!) 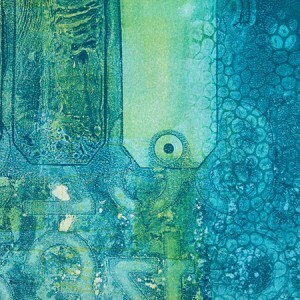 and textures are pressed into the surface before the images is taken off onto paper or cloth. Explore both techniques to create a library of surface textures ready to further enhance with stitch or manipulation.